Turn your work after each row so you are working back and forth along the rows. The cowl (unbottoned and laid flat) measures approximately 80cm long by 25cm wide. 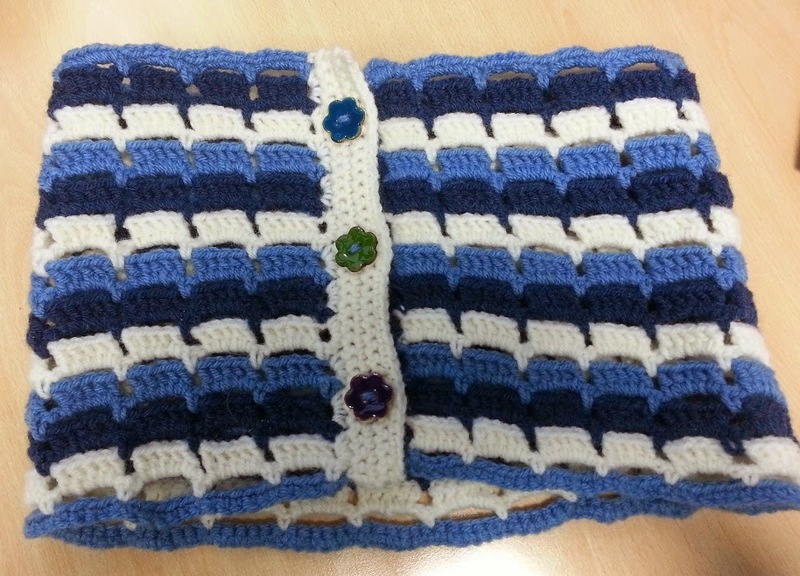 This is a super speedy pattern repeat and can be adapted very easily for blankets. To start make a foundation chain of 128 - which is multiples of 6 plus 2 at the end. If you want to make the cowl longer or if you are using a double knit yarn do more multiples of 6 to get the desired length then two last chains at the end. Row 1 - Starting in the second chain from your hook, make 1 DC in each chain along. Row 2 - Change colour by drawing a loop of your new colour through the loop on your hook. 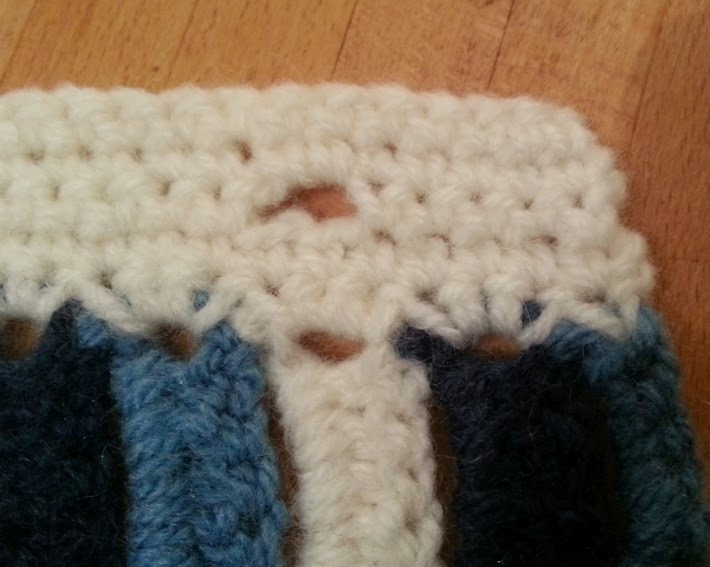 Chain 1 *Chain 5, skip 5 stitches, DC in the next stitch* repeat along the row until you get to the end. Row 3 - Using the same colour as the previous row, Chain 3, *5 Tr in next Chain loop space, Chain 1* repeat along the row and make one last Tr in the 6th Chain of the last Chain loop space. Row 4 - Change colour, Chain 6, *1 DC in next Chain 1 space, Chain 5* repeat along the row and make one last DC in 3rd Chain of the initial Chain 3 of the previous row. Row 5 - Chain 3, *5 Tr in next Chain loop, Chain 1* repeat along the row until the end and make one last Tr in the 6th Chain of the last Chain loop space. You can carry on repeating rows 4 and 5 until you have the desired width if you are making a bigger cowl or using a finer yarn and then do Rows 24 and 25 to finish off the top of the cowl. Row 25 - Chain 1 *5 DC in next chain loop, Chain 1* repeat along the row and make one last DC in the 6th Chain of the last Chain loop space. Sew all the ends in neatly on the wrong side of your work. For the edging you will be working out of the ends of the rows, so turn your work so that the very first DC that you made is on the top right. Attach your yarn by drawing up a loop throughh the edge of that DC. Row 1 - Chain 1, make 3 DC around the first Treble of the next row. Carry on making 3 DCs around the post of each Tr along. Make one last DC in the DC of the last row of the main cowl. Row 2 - Chain 1 and turn, 1 DC in each DC across. Row 4 - Chain 1 Turn. Make 1 DC in each stitch across with 2 DC in each of the 3 Chain loops. Row 5 - Chain 1 Turn. 1 DC in each stitch across. Make the other side of the edging in the same way only miss out Row 3 (Button Hole row) and make a row of DCs instead (5 rows of DCs). Sew in all ends on the wrong side of your work and sew on the buttons making sure they line up with the button holes. 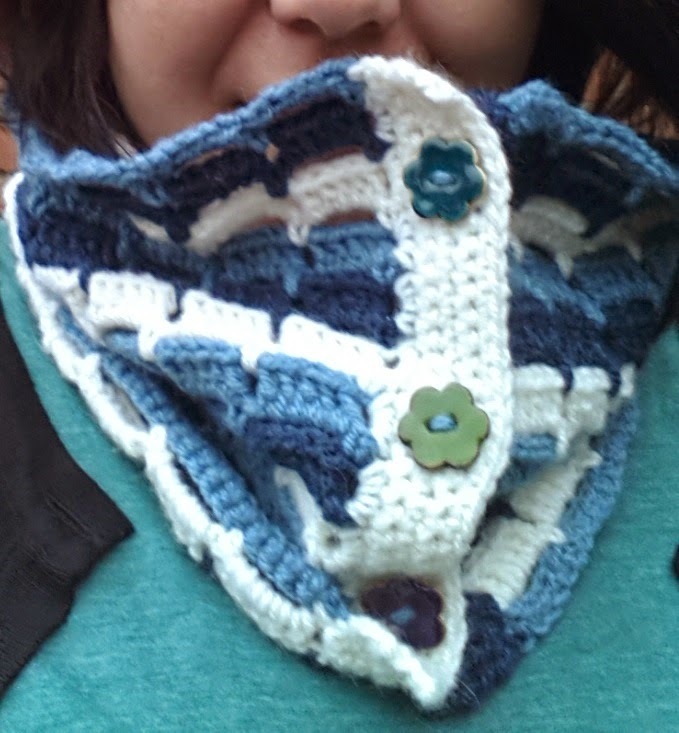 Now you have your very own finished Super fast button-up cowl.